Toronto, ON – The Canadian Hockey League in association with the Western Hockey League, the Ontario Hockey League, and the Quebec Major Junior Hockey League, today announced the coaching staffs for the 2018 CIBC Canada Russia Series. The six-game series features regional league teams of Canadian National Junior Team candidates competing against the Russian National Junior Team and is an integral part of the identification process for Team Canada prior to the IIHF World Junior Hockey Championship which returns to Canadian soil this December in Vancouver and Victoria, British Columbia. 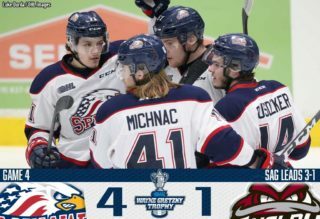 Leading Team OHL will be Derian Hatcher of the Game 3 host Sarnia Sting on Thursday November 8, while Greg Walters of the Game 4 host Oshawa Generals will assume the head coaching position on Monday November 12. Hatcher, now in his fourth season with the Sting, will work alongside his assistants David Legwand and Brad Staubitz. 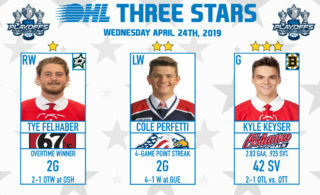 Walters, in his first OHL season with the Generals, will be joined by his assistants Nathan McIver and Greg Nemisz. Elsewhere across the country, Canada’s National Junior Team staff are at the forefront of the CIBC Canada Russia Series with head coach Tim Hunter leading Team WHL when the puck drops in Kamloops on November 5 and in Vancouver on November 6. Team Canada assistant coaches Brent Kisio, Jim Hulton, and Marc-André Dumont will also figure prominently in the November series with Kisio serving in an assistant role for Team WHL, with Hulton to lead Team QMJHL as head coach and Dumont appointed Team QMJHL assistant. Hunter won back-to-back medals as an assistant coach with Team Canada including gold in 2018 and silver in 2017. The fifth year head coach of the Moose Jaw Warriors also won a bronze medal as head coach of Canada’s National Men’s Under-18 Team at the 2015 IIHF U18 World Championship. He returns to the Team WHL bench for the third straight season where he has compiled a 2-1-1 record. Kisio’s Hockey Canada resume includes a gold medal as head coach of Canada’s National Men’s Summer Under-18 Team at the 2017 Ivan Hlinka Memorial Cup. The fourth year head coach of the Lethbridge Hurricanes was also a head coach of Team Canada White at the 2016 World Under-17 Hockey Challenge and earned silver with Team Pacific at the 2014 U17 event. Hulton returns to the Under-20 sector of the Program of Excellence for the first time in over a decade having previously won World Junior silver in 2004 and gold in 2005 in assistant coaching roles. Now in his fourth season behind the Charlottetown Islanders bench, Hulton makes a second straight appearance at this event after assisting Dom Ducharme to a pair of Team QMJHL victories last season in Charlottetown and Moncton. Dumont has served as head coach and general manager of the Cape Breton Screaming Eagles since 2012-13. With Hockey Canada, he previously served as head coach of Team Quebec at the 2009 World Under-17 Hockey Challenge. Third year Kelowna Rockets head coach Jason Smith also joins the Team WHL coaching staff as an assistant for both games in British Columbia. 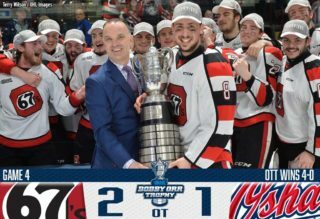 In the QMJHL, third year Sherbrooke Phoenix head coach Stéphane Julien will serve as an assistant when his club hosts Game 5 of the series on November 13, with first year Drummondville Voltigeurs head coach Steve Hartley serving as an assistant when his club hosts Game 6 to close out the series on November 15. Since the event first began in 2003, CHL teams have played to an overall record of 61-22-1-6. 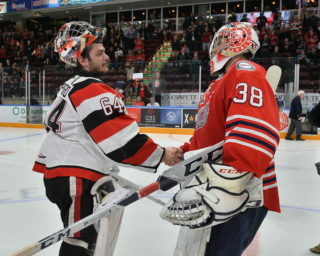 The competitiveness of the rivalry has grown in recent years with five of the last eight series decided in the final game including last season where for the first time in event history a QMJHL shootout victory determined the overall series outcome in favour of the CHL after both countries played to a 9-9 tie in points through six games.